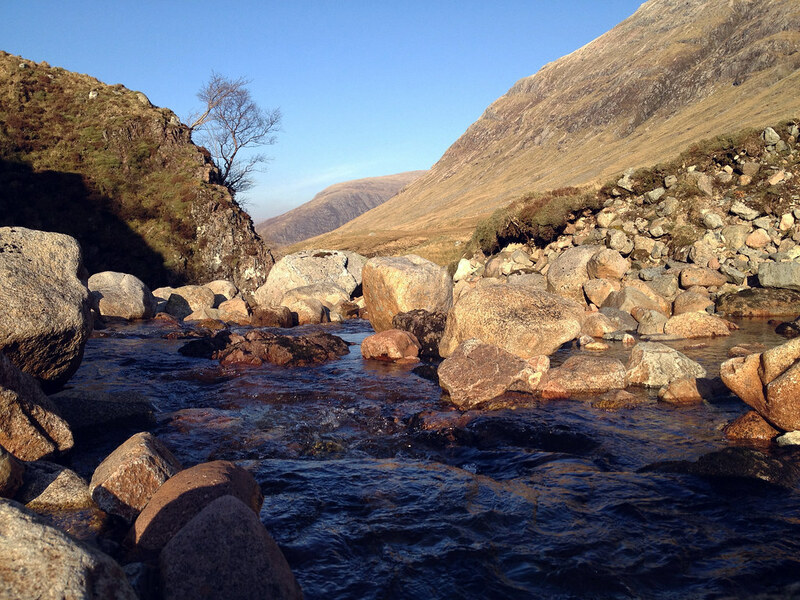 I had been up through Glencoe many times in my life, but only a couple in my adult years so didn’t know or remember much about it until I got into hillwalking. The more I read and looked at pictures the more the beast that is Buachaille Etive Mor stood out to me as a hill that had to be conquered sooner rather than later. 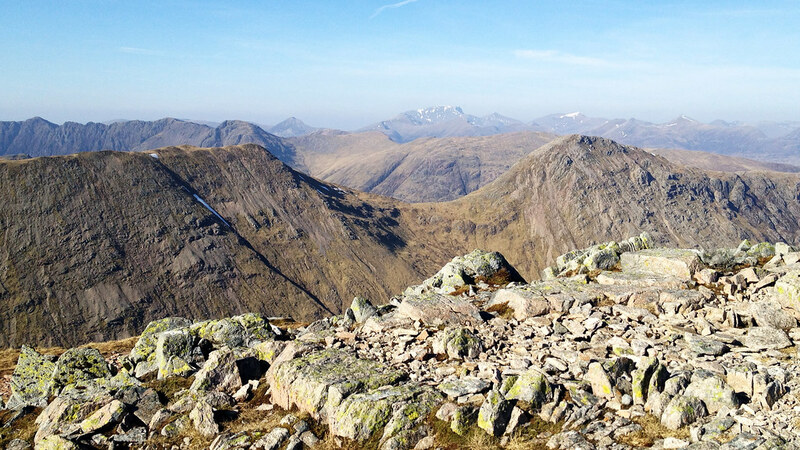 I had been up the previous year to do Bidean nam Bian with my dad (Big Bill) and it was with my old man again that I headed up Buachaille Etive Mor on this sunny spring day. The weather was hot for a day in March. It was one of those occasions which are rare enough in the summer never mind in the middle of March when shorts and T shirts were all that was needed. And sunglasses! So we took full advantage of the weather and began our walk from the usual start point of Altnafeadh at 11am which was an early start for me. 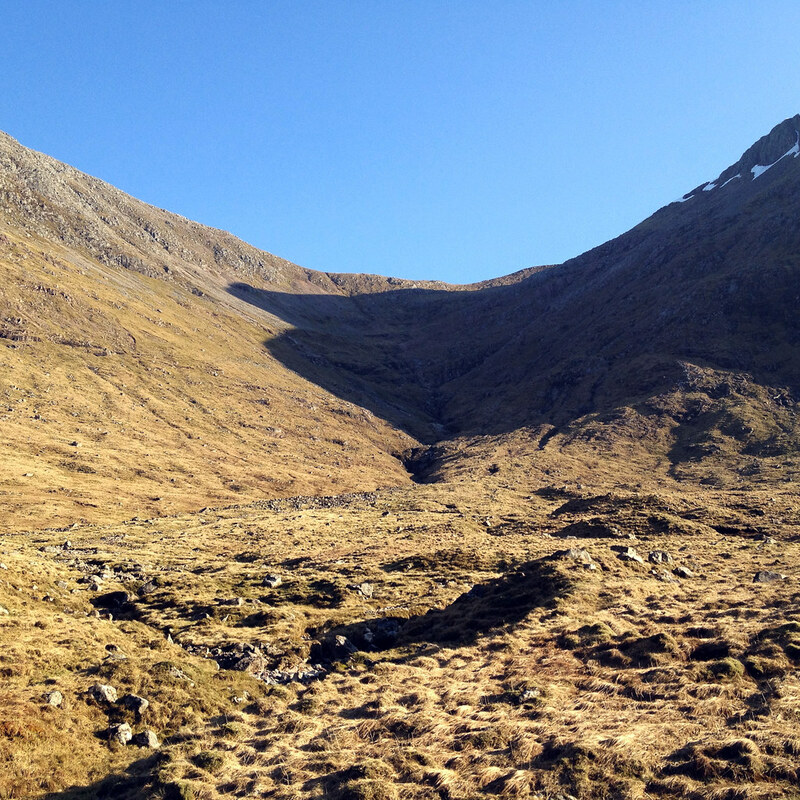 Although it was an unusually hot day, not long after we set off we had reached Coire na Tulaich to begin our ascent but it was covered in dark, cold shadows as the sun was still hiding low behind Stob Dearg. We would have to work hard to gain height to the main ridge and the privilege to bask in the warm sunshine. The path so far was well laid out and easy going but the further you got up the coire, the quality of the path lessened more and more. The final push to the ridge becomes quite steep and covered in scree. 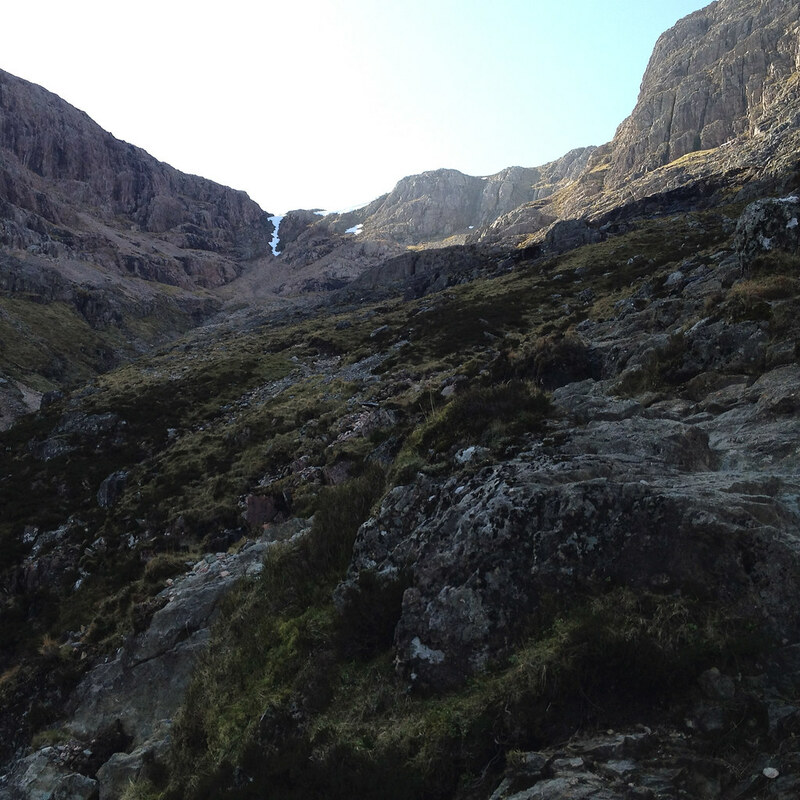 There was a large section of snow still lingering from the winter in one of the depressions at the top of the coire. We considered going up this but without axes or crampons with us it would have been silly so navigated around the side of it up some rocks requiring a good scramble. 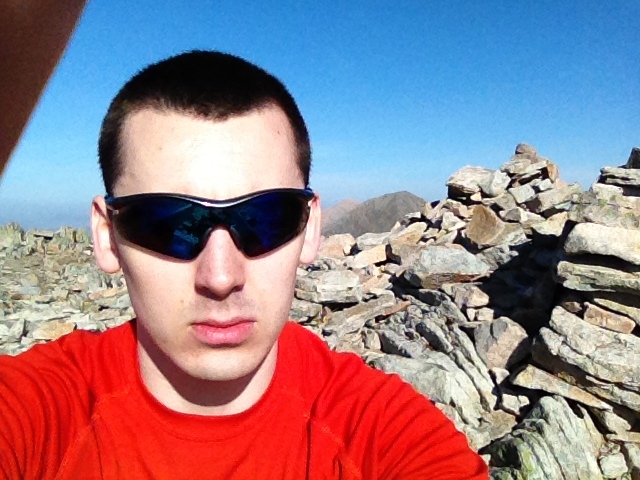 You can’t beat a good scramble so this was the more enjoyable route anyway! After scrambling the final section of the coire we had finally made it up out the shade and into the sunshine and it was worth the effort. 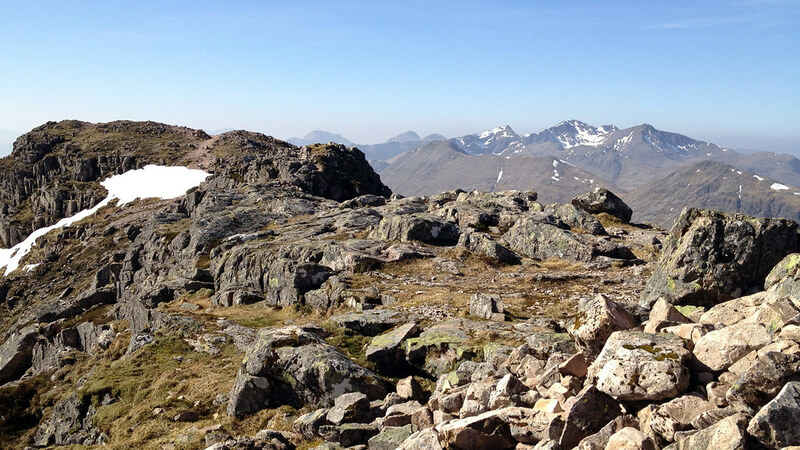 Nevis could be seen behind us, the route for the rest of the day to the right with Bidean nam Bian in the background and lastly, to the left, our next task; the route up Stob Dearg, our first Munro of the day and the highest summit of this range at 1022m. Having climbed most of my Munros so far in the most southerly parts of the country, it’s always a nice change to get on some real rocky hills and Buachaille Etive Mor was no exception. It seemed like the hard work for the day was over now anyway, we were up on the ridge and now we just had some enjoyable walking and sightseeing around Glencoe to do! 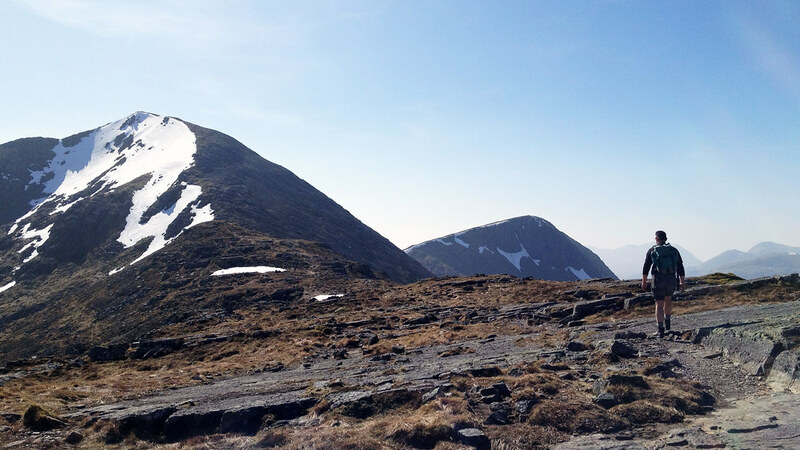 The summit of Stob Dearg was reached with ease and we sat looking down towards Rannoch Moor while tucking in to some well deserves cheese and ham pieces. 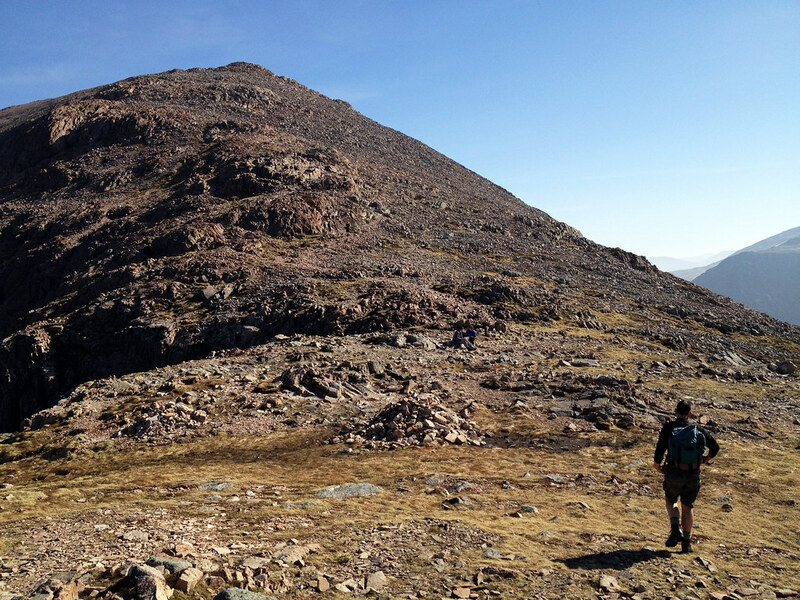 Once our weary legs had been well rested we were on our way again back down Stob Dearg and along the ridge to the other summits. 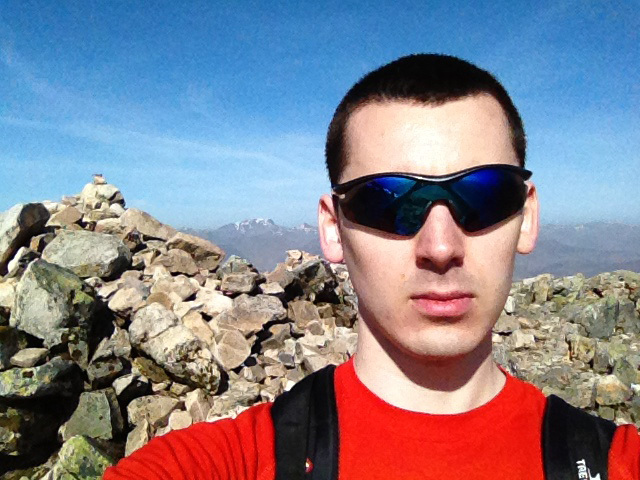 First on the list was the Munro Top of Stob na Doire. 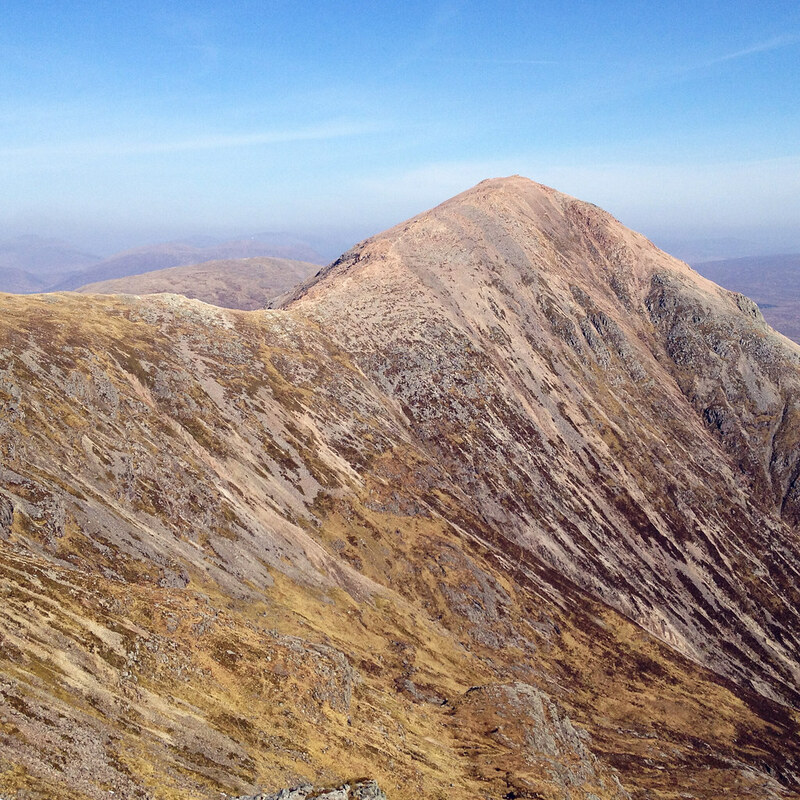 At 1011m it is higher than the second Munro of the day we had yet to scale, Stob na Broige. 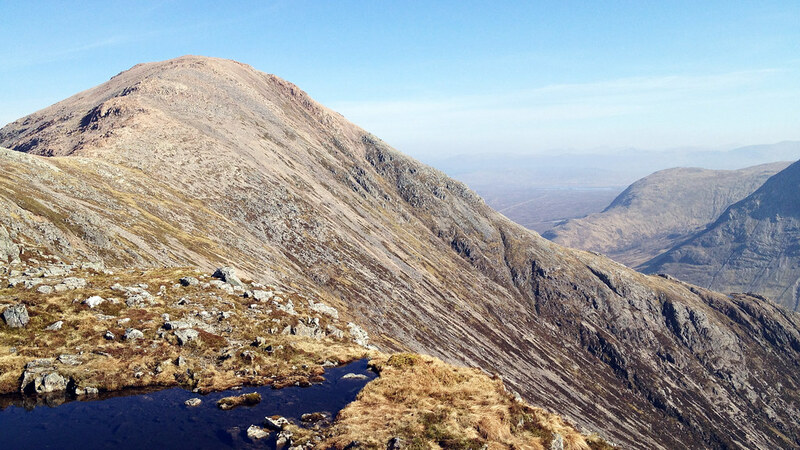 Also being more than a mile away from Stob Dearg you could possibly think this would be classed as a Munro as well but apparently not. 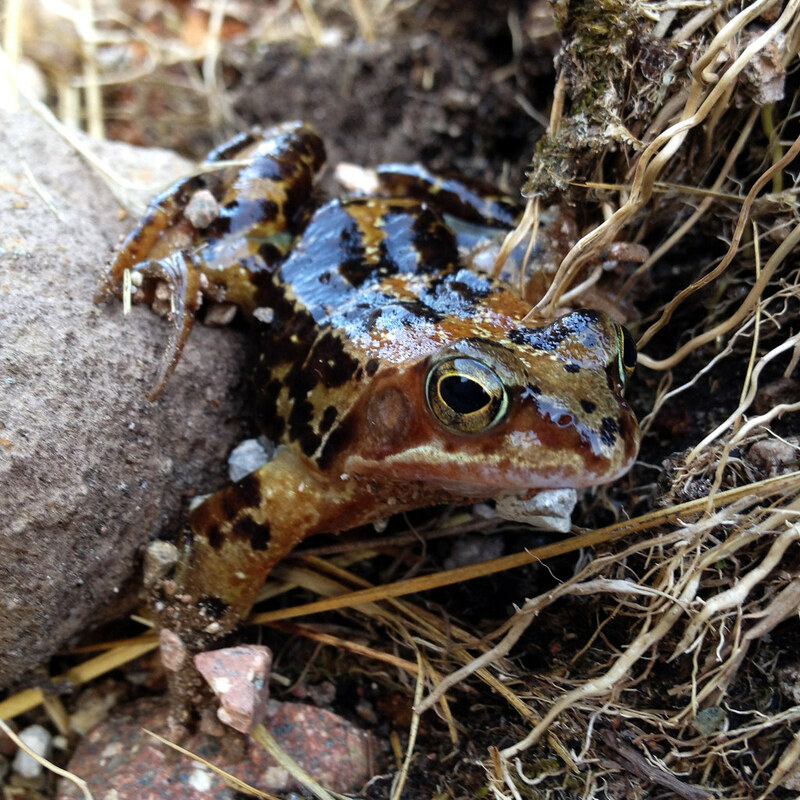 Only 120m or so of ascent from our position will be the reason and it was quite easy to reach because of this. Most of my time at this point was spent looking behind me at the fabulous views of Stob Dearg opening up the further and further away I got from it. 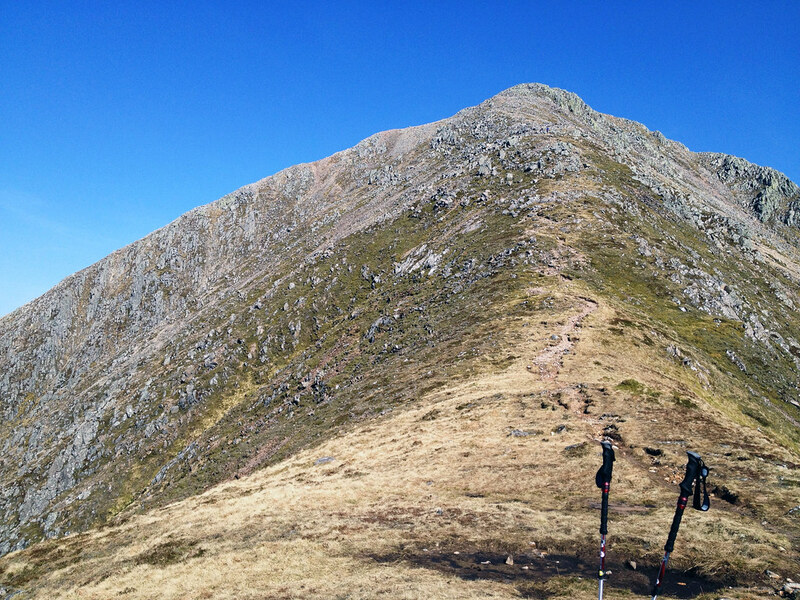 Last on the list before reaching the final Munro was Stob Coire Altruim. 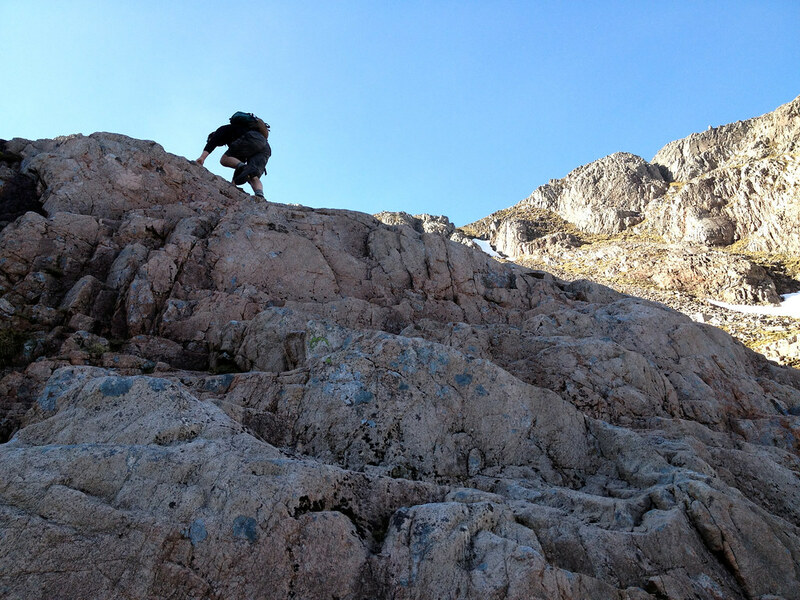 This was another short ascent so not much bother at all to reach. The path was quite easy too meaning we could just enjoy the scenery and take in all the spectacular views of Glencoe which was still quite new to me. Something else still quite new to me was being up the hills with that strange phenomenon of a blue sky and bright sun overhead! I could get used to this. 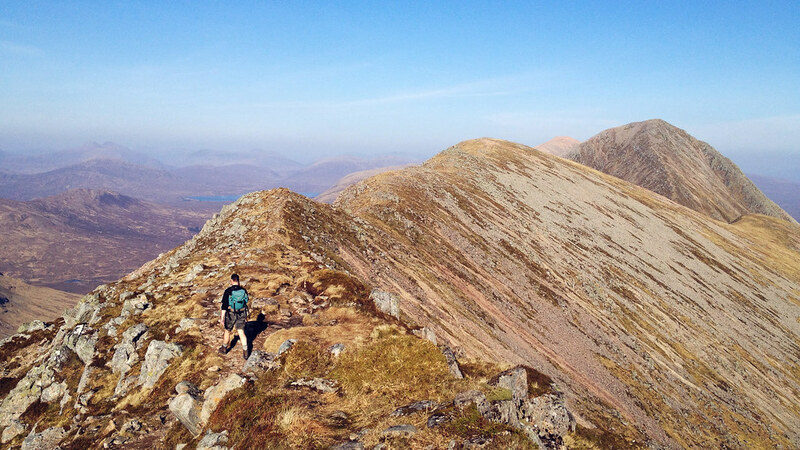 The easiest part of the day was the ascent of Stob na Broige. 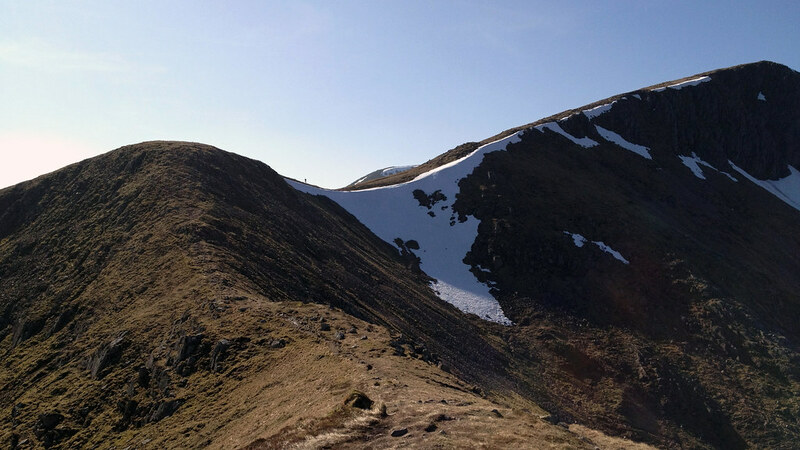 Even when looking at the profile of the GPS track, this section looks a very small ascent but the powers that be deemed it special enough to meet their bewildering Munro criteria and it was promoted to Munro status in 1997. A lot of people would have probably missed this fine hill out before its promotion but it acts as a brilliant viewpoint for the area around so I’m happy for its inclusion now. 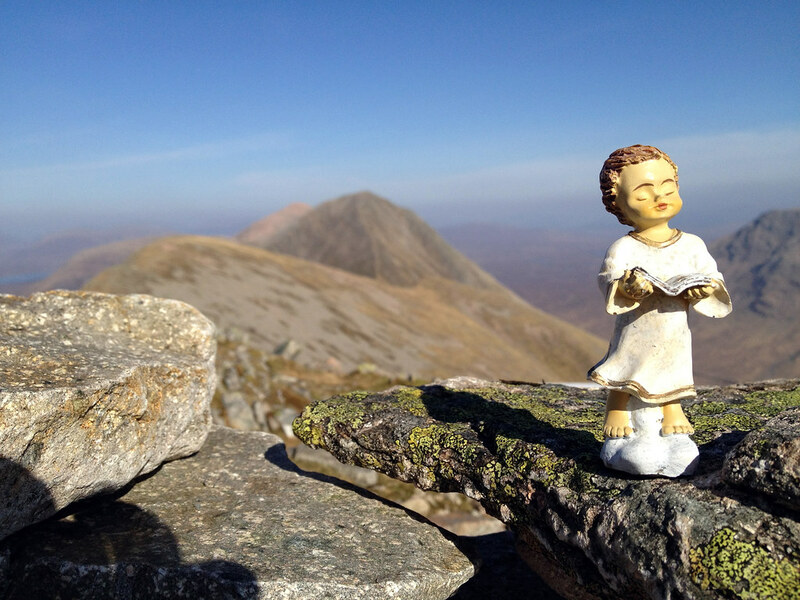 The strange thing about the cairn here was this little guy I found amongst the rocks. I had seen it briefly in someone else’s walk report before going up and thought nothing of it then laughed when I saw it for myself too! Someone must have wanted to leave their mark on the hill. 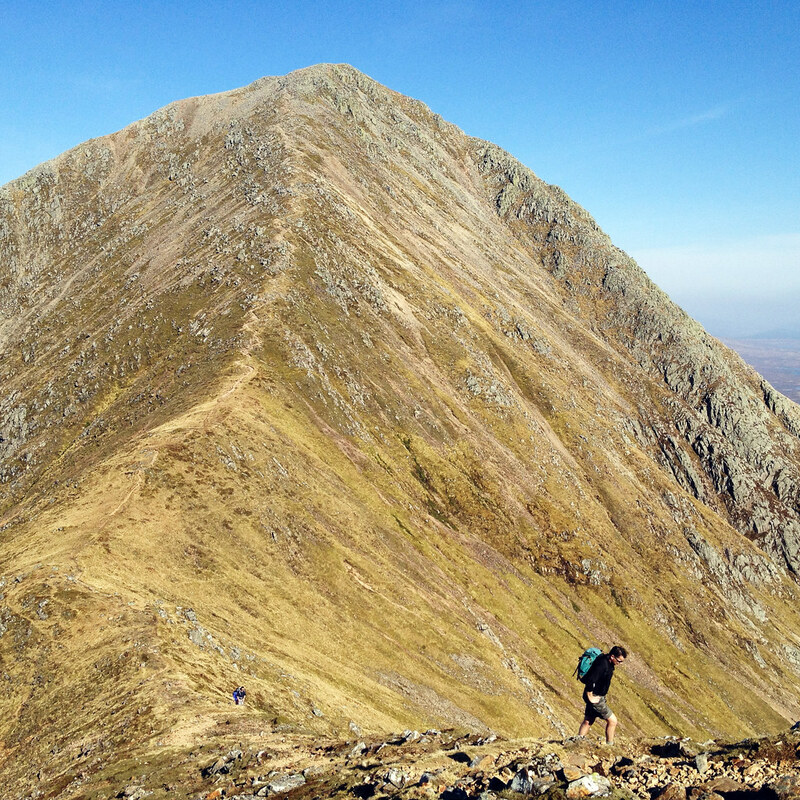 When it was time to head back down I was quite glad as it meant a view all the way along the ridge we had just walked with Stob Dearg still looking mighty in the background. We were following the regular route for this walk so descending via Coire Altruim and for a wee change on this walk, the ground beneath us was mostly grassy so the descent wasn’t too bad. 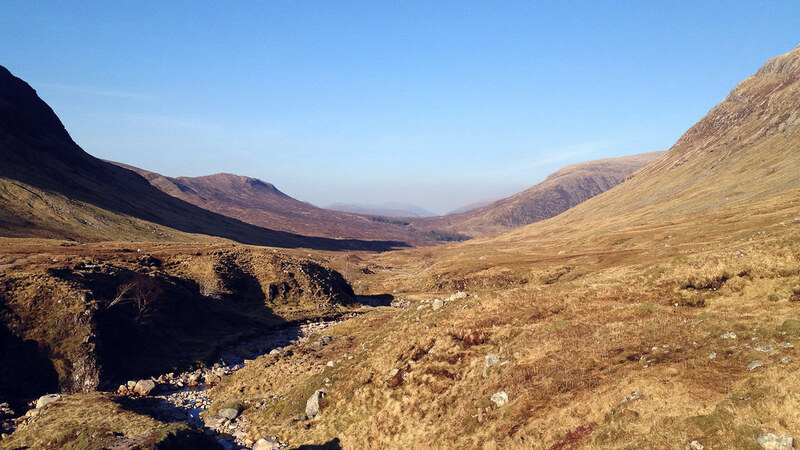 Once at the bottom, we were in the pass known as Lairig Gartain. We crossed the Allt Coire Altruim and followed this north east all the way back to the car, via a short walk along the road at the end. Once again, a great day in the hills. It almost felt like cheating to get what was pretty much a summer day out in March. It was made even better being out with my dad, the few times we’ve went up the hills together he has always chosen the best ones; The Black Mount & Bidean nam Bian previously, and now Buachaille Etive Mor. 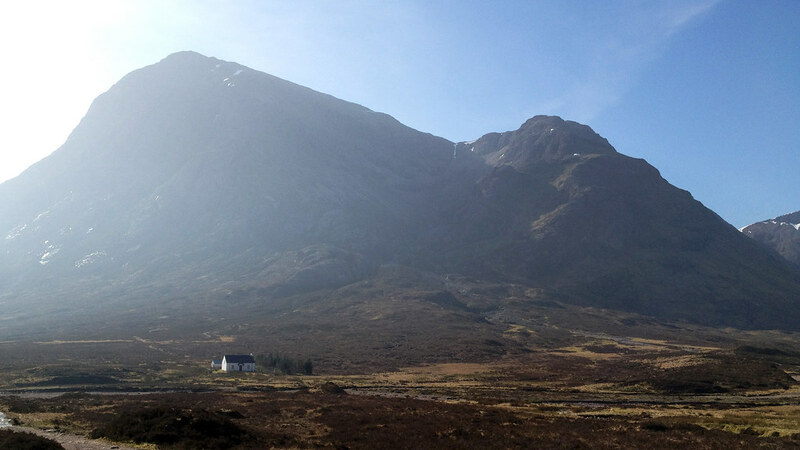 I’ve always been fascinated with Glencoe and now I can safely say it is my favourite place on the planet. Roll on the next adventure here!